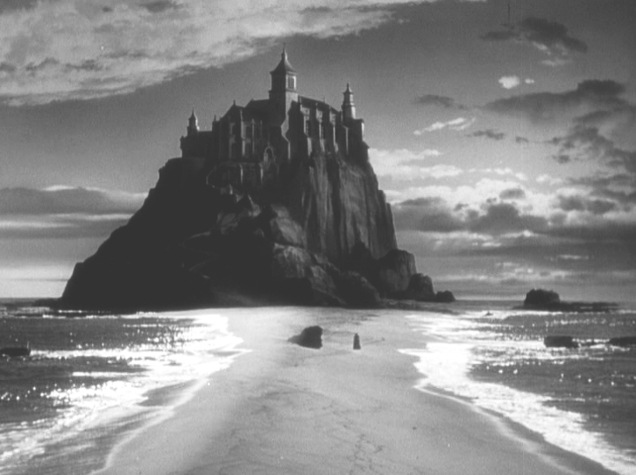 I've covered many MGM films in this blog over the past couple of years, with this picture one I've been meaning to pay tribute to for some time. 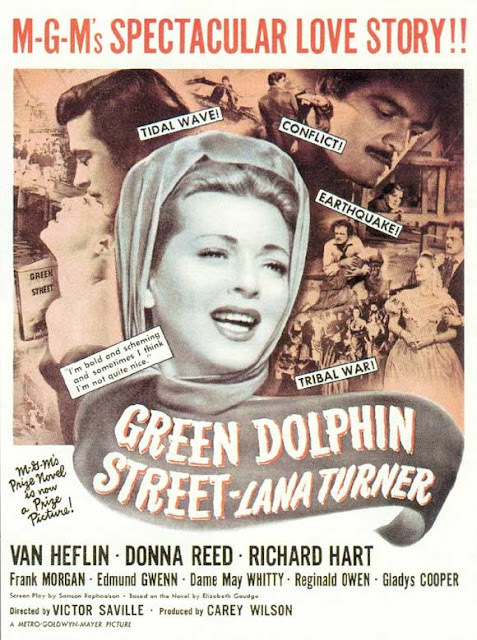 A grand production, based on the best selling novel, MGM's lavish 1947 costume drama of romantic entanglements among 19th Century pioneers in wild New Zealand, GREEN DOLPHIN STREET proved to be a bona fide field day for the Metro visual effects department. I first saw this film on TV in the seventies - back when NZ Network TV used to always show classic movies uninterrupted on Saturday and Sunday afternoons. Those were the days....long gone sadly. 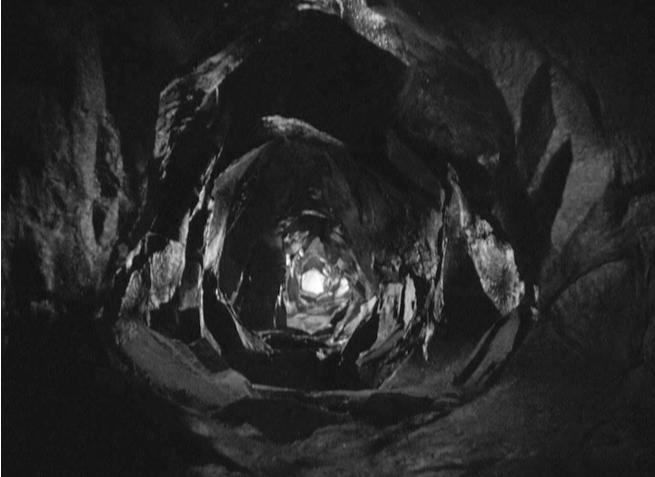 Even as a budding effects fan then I was very impressed with the visuals on show here, though as this was pre-VCR there was no way to capture those wonders for repeat inspection. It's long overdue arrival on DVD is most welcome. 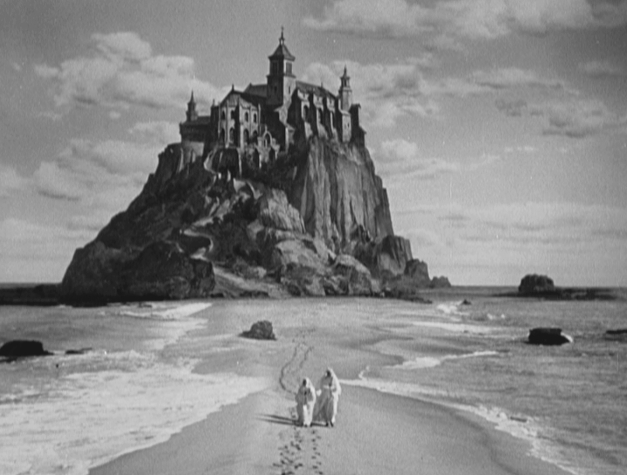 The scenario provided the MGM boys a great many opportunities to strut their stuff up on screen - from period matte paintings of 19th century townships and a haunting, forboding mountain top convent - through to a spectacular earthquake and tidal wave which wrecks havoc in pioneer era New Zealand. Interestingly, none of it was actually shot down here, with most of the NZ scenes having a distinctly Californian look - right down to the obviously inaccurate native bush, and the local Maori tribes being clearly played by Hollywood extras in greasepaint - as was the tradition of the day. Career Metro Goldwyn Mayer special effects chief, A.Arnold (Buddy) Gillespie was in charge of all miniature, process and physical effects, while his counterpart and longtime associate in the matte department, Warren Newcombe, took care of the numerous pictorial demands. I've outlined both of these key players extensive careers in several previous blogs. 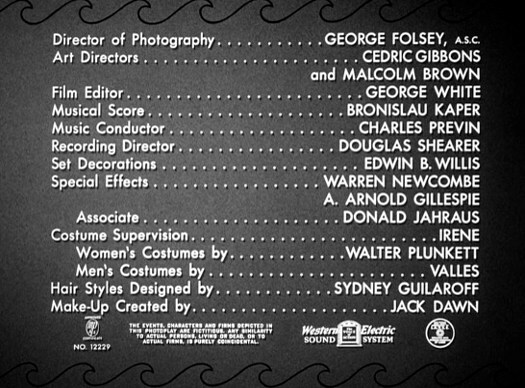 MGM had a vast stable of top shelf matte artists during this period, though the only name I can say for sure painted on this show was the legendary Norman Dawn. For those not aware, Dawn was the inventor of the painted matte process and contributed hugely to the overall development of the technique. 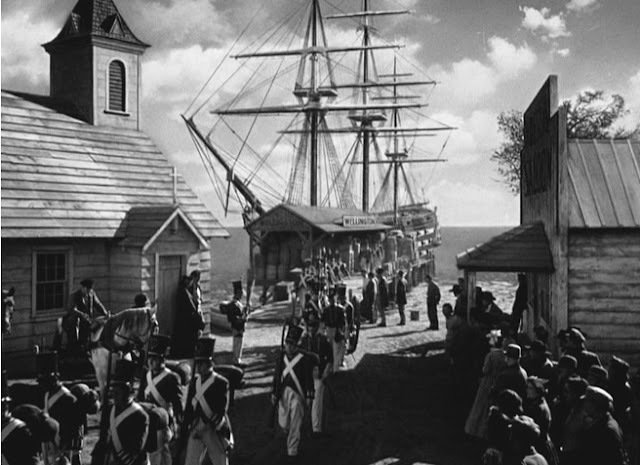 For a few years in the mid forties Dawn worked under Newcombe in the MGM matte department along side such noted artists as Henry Hillinick, Howard Fisher, Joe Duncan Gleason and Rufus Harrington among others. In all likelihood these same painters shared matte duties with Norman on GREEN DOLPHIN STREET, though we shall never really know. 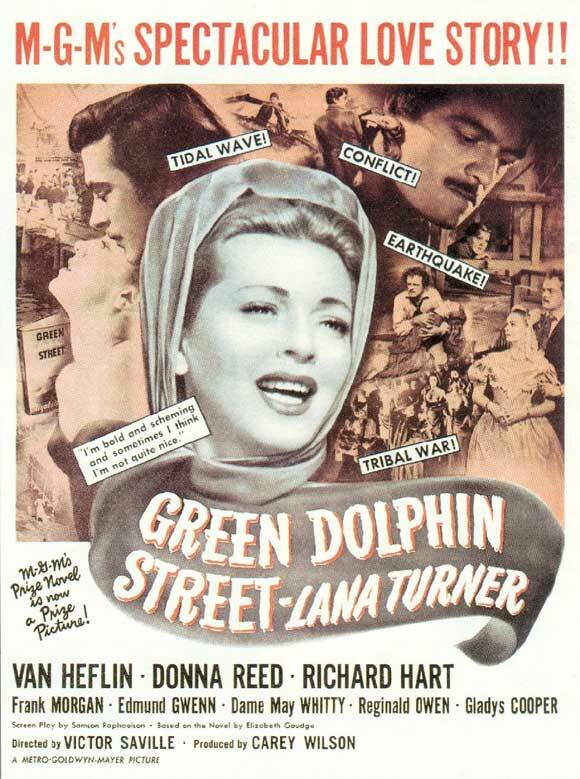 Interestingly, in Dawn's own meticulously archived production logs he wrote of being approached by chief art director Cedric Gibbons during the GREEN DOLPHIN assignment to potentially take over the MGM matte department due to ongoing 'issues' - though he declined the offer. The lengthy narrative is a bit plodding, and the characterisations somewhat stodgy, but it's the visual effects side of the deal that I'm interested in, so let us take a look shall we. 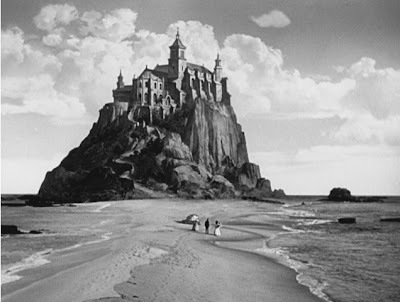 The films stands out in several areas - beautiful matte art and gob smacking miniature work - as was the usual standard from Metro Goldwyn Mayer of the day. 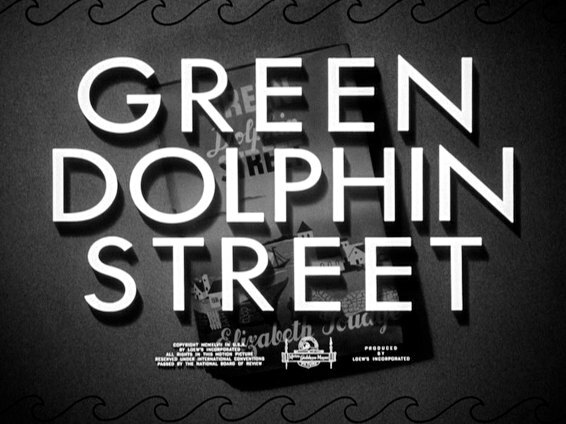 I'd like to also draw attention to the outstanding use of rear screen process projection which is featured throughout GREEN DOLPHIN STREET. 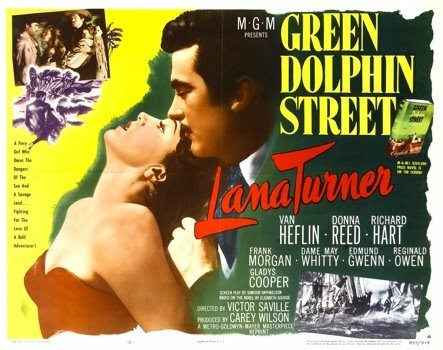 I'd go so far as to say that I feel MGM really cornered the market in this technique for decades, with just Paramount even coming close. 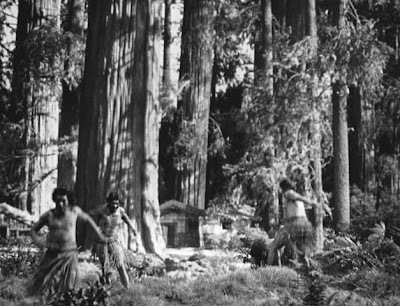 The use of very large screens, cleverly interwoven with sets and decor was a Metro trademark (just look at the 30's TARZAN pictures for sensational process work). 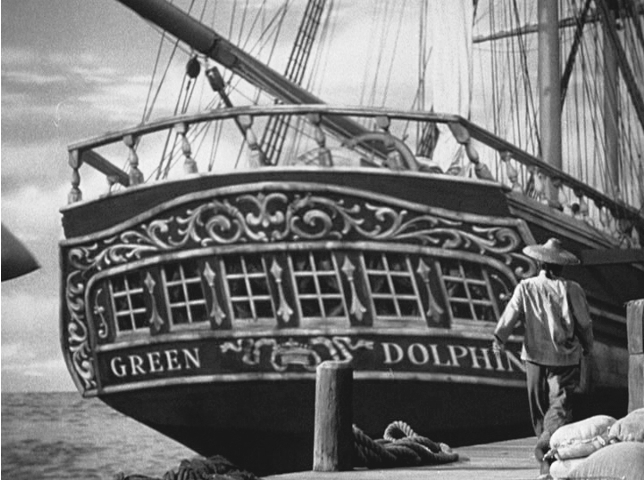 Arnold Gillespie had a lot to do with the development of improved means of producing high quality process shots in later years with astounding results on huge screen Ultra Panavision work on MUTINY ON THE BOUNTY (1962) using three projectors. 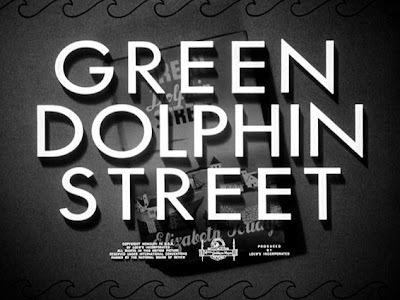 So, here's a tribute to the Oscar winning special visual effects from GREEN DOLPHIN STREET. 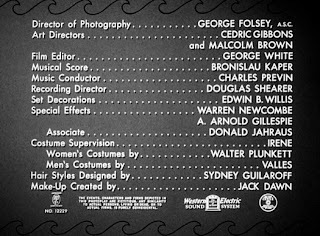 Special Effects Technicians: Glen Robinson, Robert MacDonald, A.D Flowers, Robert Staples, Dario Mortar, Carl Friend, Virgil Beck, Hal Dumas and Charles Schulthies. 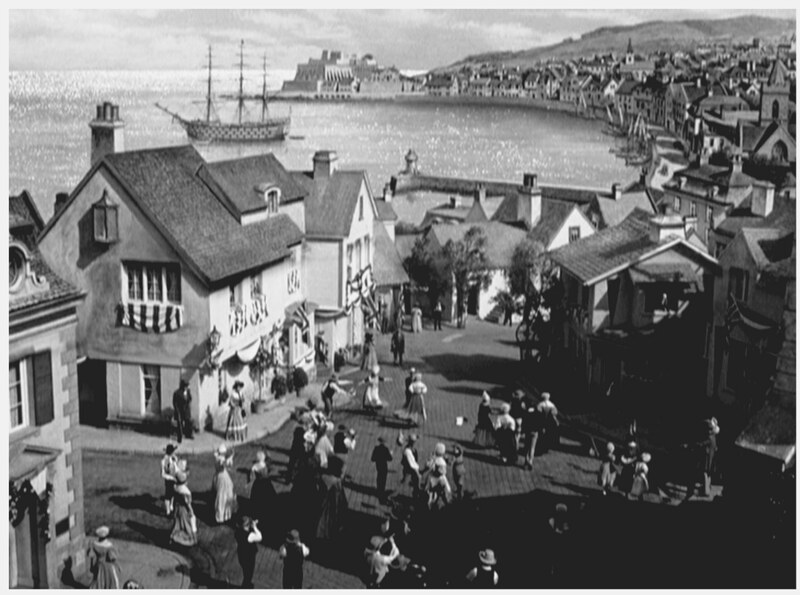 The opening matte of the hilltop convent in the Channel Islands is an extensive painting with ocean plate. I've recently been informed by visual effects man Jim Danforth that career Metro matte painter Howard Fisher did in fact paint mattes on GREEN DOLPHIN STREET. 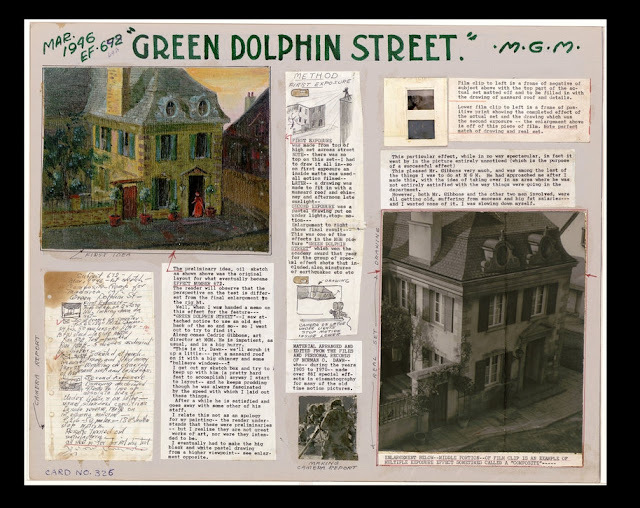 Jim worked with Howard on the 1962 IT'S A MAD, MAD, MAD WORLD and Fisher regaled Jim with interesting stories such as how he and other artists under Newcombe discretely painted a pair of copulating dogs in one of the GDS town paintings for fun! Who ever said that matte work was dull. 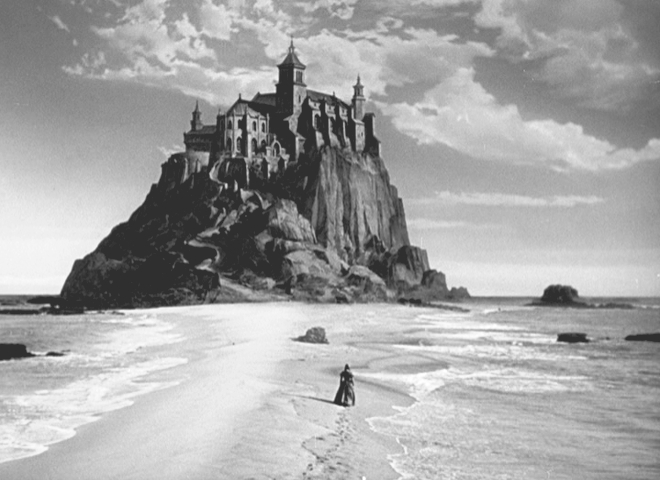 An artful multi part Newcombe composite of the Gothic looking convent. Painted mountain, convent and sky with twin live action plates either side of the two nuns of the breakers coming in. The view from the top. 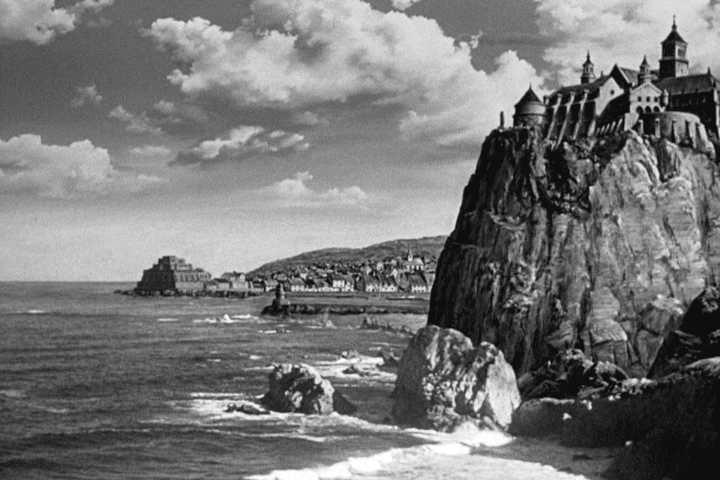 Small sound stage set foreground action combined with Newcombe matte of painted mountains, town and sky with actual ocean plate. One of two confirmed Norman Dawn mattes in this production. 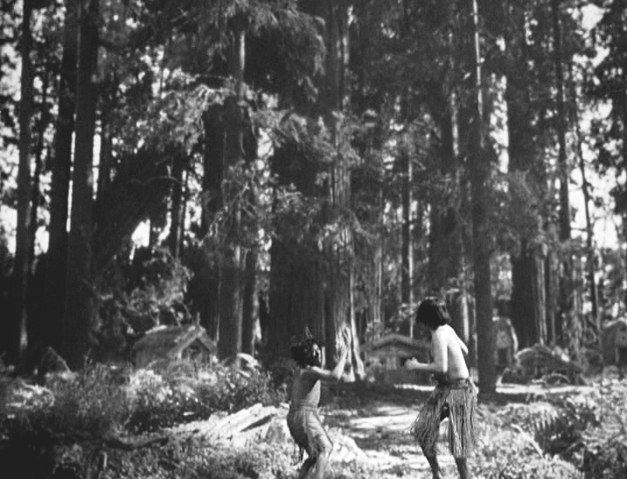 This assignment was one of the last effects shots executed by Dawn for Warren Newcombe during Norman's MGM period of employment. 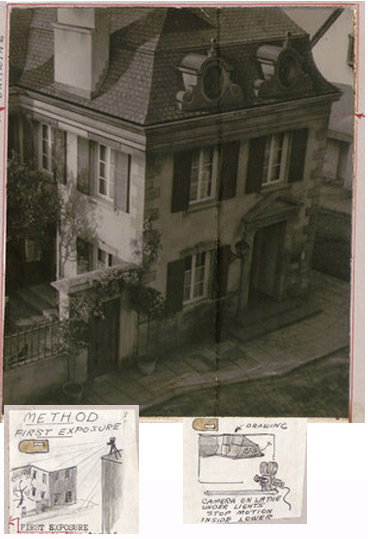 Close up shot breakdown from Norman Dawn's own records demonstrate the painted elements (rooftops) which were added to an existing Metro backlot set. Throughout his long career, Norman Dawn meticulously catalogued shot by shot breakdowns of every one of his 800 odd trick shots. These are in the collection of the University of Texas and the transcript of all of those effects makes for fascinating reading indeed. This sprawling matte shot is possibly a Howard Fisher painted shot . The convent again, this time with a different sky. 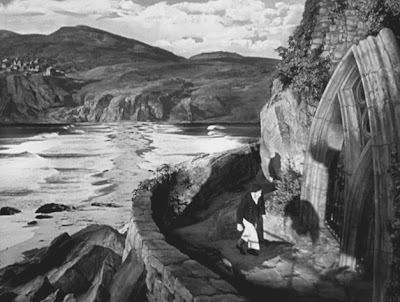 The vantage point is repeated numerous times throughout the film, with fresh sky and cloud effects on each occasion. Newcombe's unit were top of their game when it came to clouds and beautifully rendered skies. Possibly painted by MGM stalwart Howard Fisher who would have fame in the mid fifties with his iconic Krell Reactor Chamber matte for FORBIDDEN PLANET. 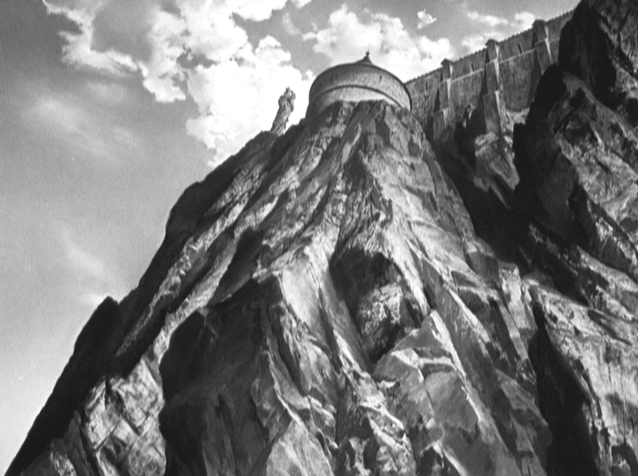 A full screen matte painting of the upward view of the aforementioned convent. 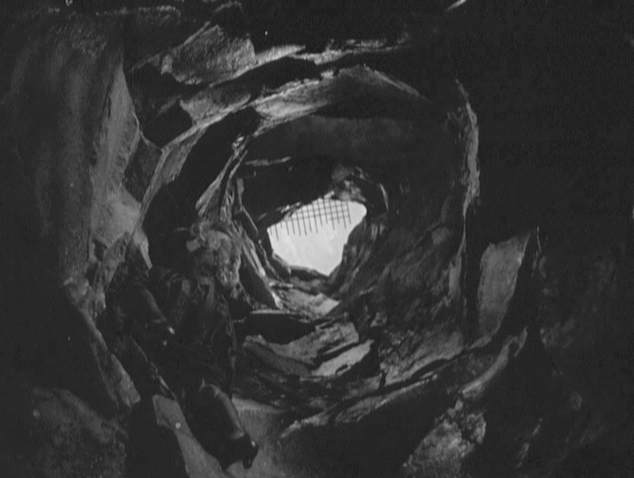 The shaft through the rock which leads up to the convent. 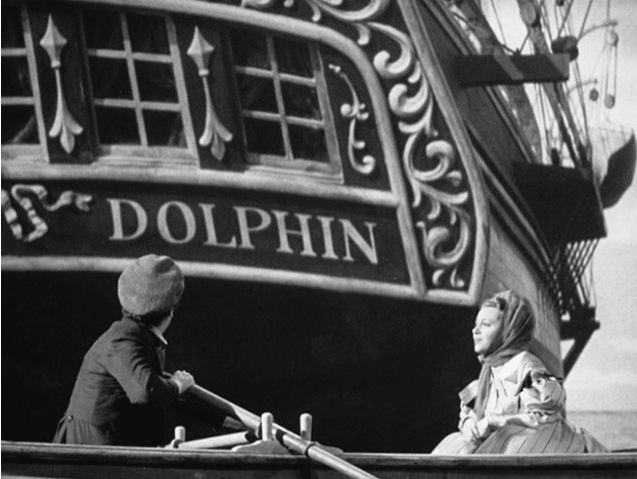 Donald Jahraus' detailed 2 inch to the foot scale model of the Green Dolphin process projected behind actors. Top shelf process work here, as was customary with this studio. 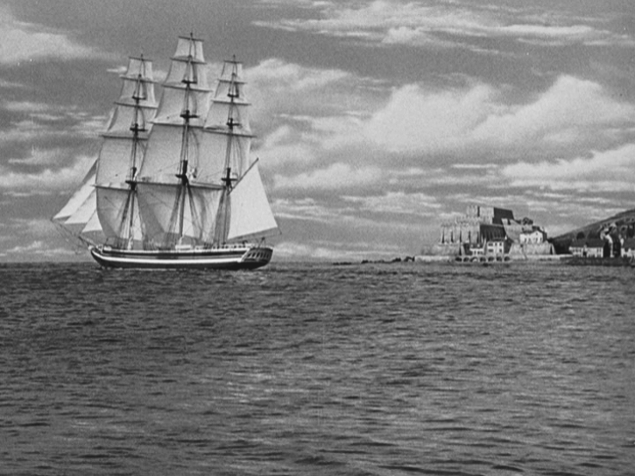 Again, the fairly large scale model ship used here. Miniatures of The Green Dolphin and township, with painted sky backing in the MGM tank. 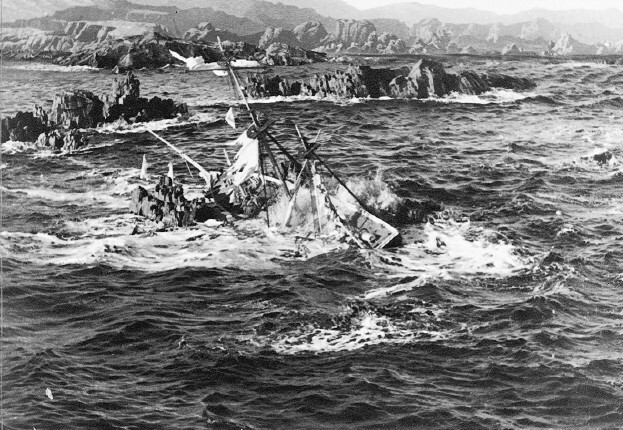 Arnold Gillespie would oversee all model shots from his custom built camera skow, affectionately known as the S.S Gillespie. Another excellent example of MGM's rear screen process projection featuring crisp background plate of miniature ship. A later matte of the shaft in the rock as a character clambers to the opening at the top. 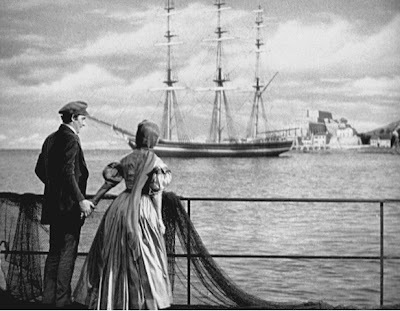 Rear projection scene using a Newcombe painting and ocean matte. A wonderful flawlessly blended Norman Dawn top up matte shot described in Dawn's own special effects log sheets as: "Effect 671-double exposure matte which created a dock front setting by combining a foreground shot at a coastal town and a pastel sketch background of sea, sky, dock building, pier and sailing ship". 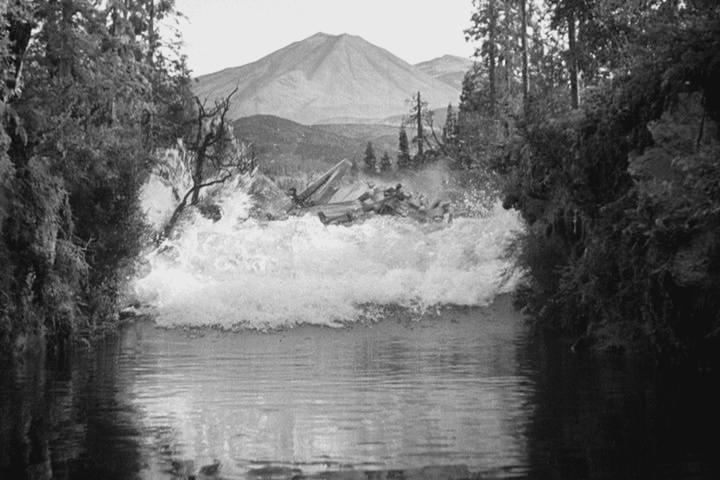 The New Zealand sequences feature a ripper of an earthquake and tidal wave, with several great full scale physical effects such as this shot where the earth opens up and swallows a none too convincing 'NZ Maori' extra. Effects head Buddy Gillespie did similar wonders with James Basevi on an even grander scale years before on SAN FRANCISCO to fine effect. 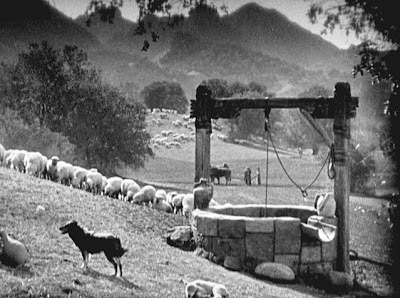 Fred Sersen did even bigger variations on this over at Fox for THE RAIN'S CAME which took an Oscar in 1939. The later 1974 Universal picture EARTHQUAKE floundered in this respect by not being anywhere near as adventurous as these vintage classics. As mentioned earlier, MGM's rear screen process work was really far and above other practitioners of the day, and is no better demonstrated than in this astonishing set piece where the quake knocks over a vast New Zealand Kauri forest. The considerable Don Jahraus forest set featured exquisite miniature trees constructed by Roy Cornish, who specialised in miniaturised foliage and such. 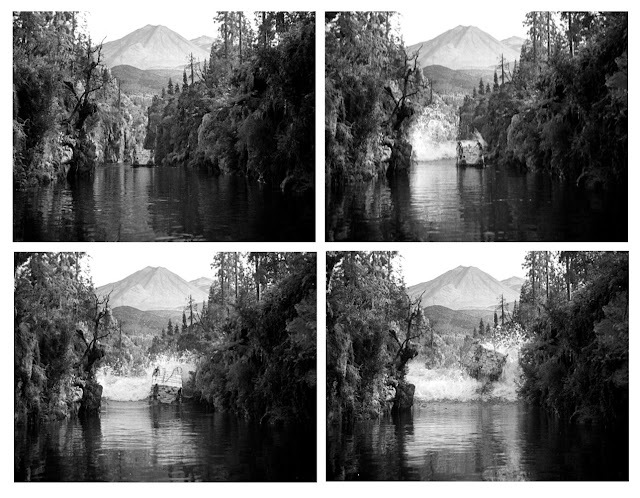 Frame by frame demonstration of the above sequence, with notably 'even' illumination and contrast of the process plate on a very large translucent screen all tying in perfectly with the foreground action. Fantastic stuff! Technicolor was never as kind to process photography as was monochrome. Flawlessly photographed by Maximilian Fabian, this extensive miniature setting of the approaching tidal wave wiping out the gorge is really only let down by the lack of dense native bush foliage which comprises this sort of NZ landscape. The long shot substitutes gypsum for water coming down the mountainside to ensure good scale between foreground and background. 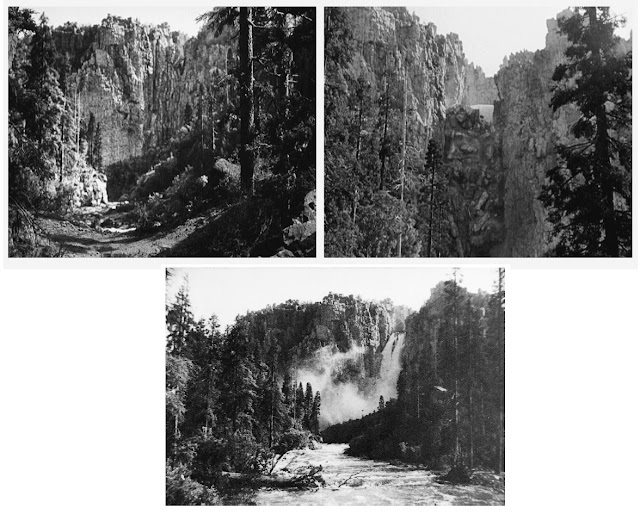 Terrific scale for the convincing deluge, though again, the trees really aren't what we have here - especially for the era. Think more 'Skull Island' jungle and you'd be nearer the truth. The enormous wave heads downstream. 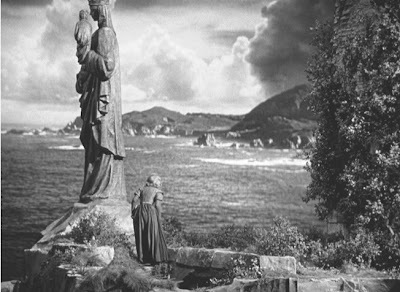 Fabian's outdoor shoot using natural light paid enormous dividends here and on many other MGM effects shows such as 30 SECONDS OVER TOKYO. 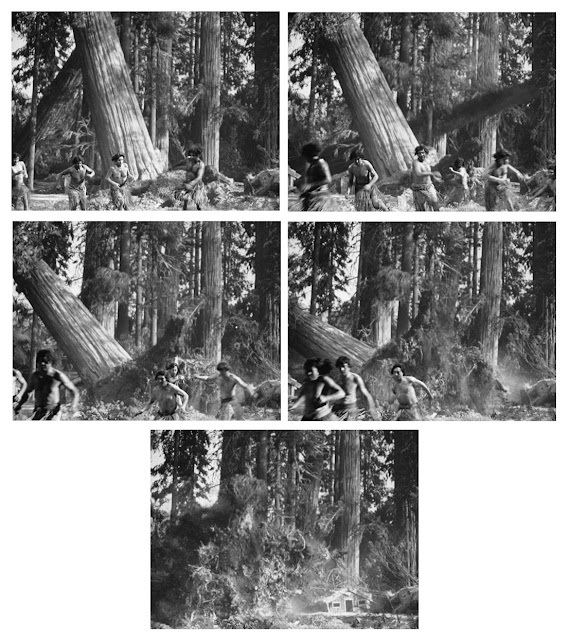 A closer look at that most impressive effects sequence. 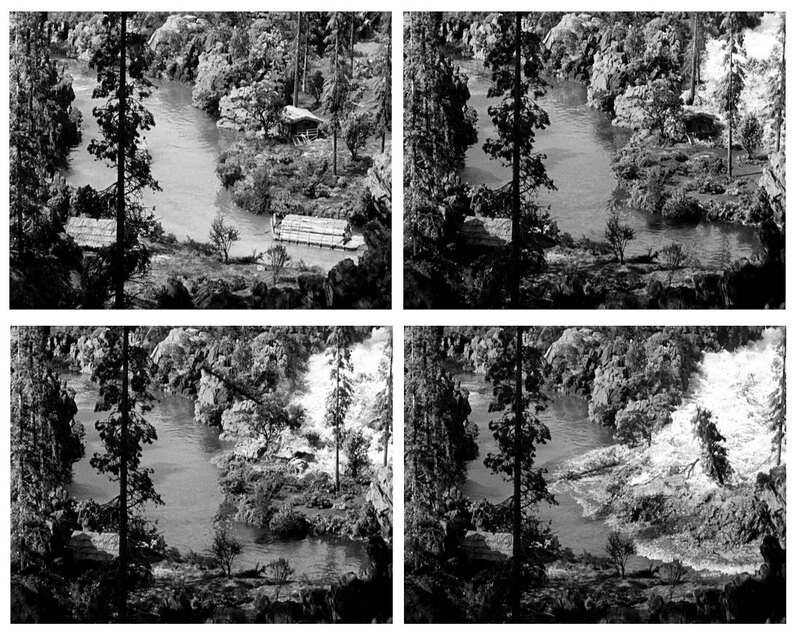 And if that weren't enough, the giant deluge sweeps on down the Wanganui River, wiping out logging rafts and people along the way. 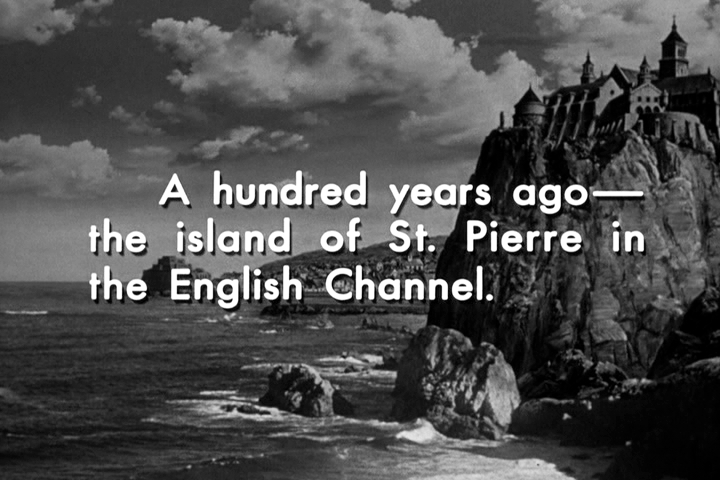 Excellent scaling of water and destruction with superb deep focus cinematography - something which can be lacking in many films of the period where depth of field problems killed the credibility. 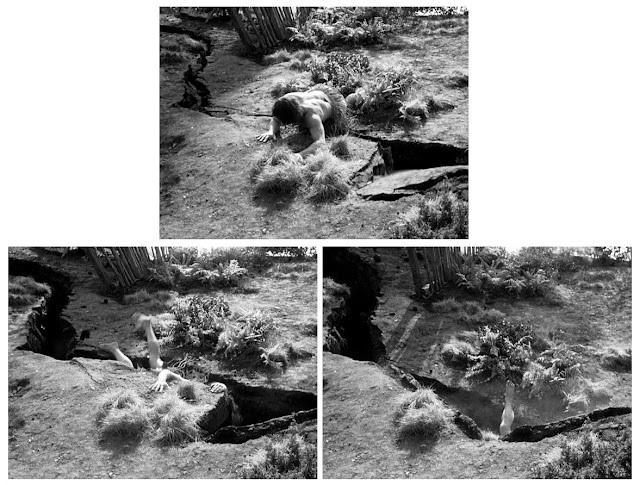 An elaborate Don Jahraus miniature set of the Wanganui River, NZ, with highly detailed 'human' figures on the raft built by specialist Henry Greutert in the Metro model shop and shot in daylight for maximum effect. 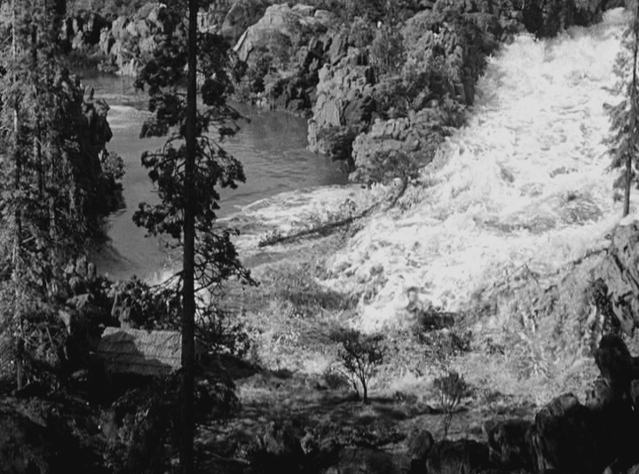 Now, the topper... the giant wave ploughs it's way down river and into Van Heflin's raft in what can best be described as a truly virtuoso effects shot. 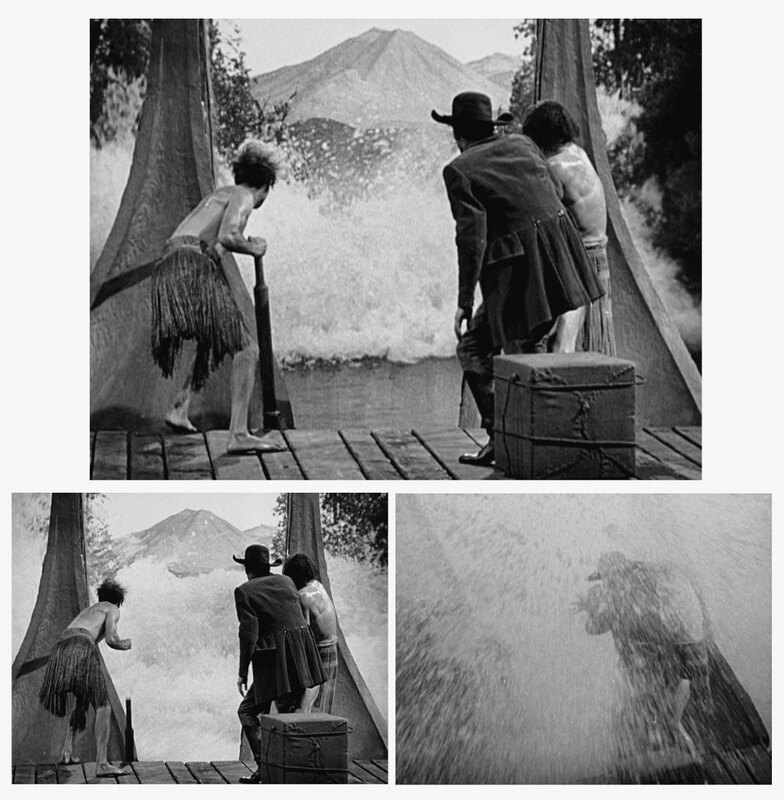 The river, water and scenery are all rear projected miniatures which, as soon as the wave reaches a certain point, real water erupts all over the actors, washing them overboard. A great shot that looks sensational in motion. Effects head Gillespie constructed a special device under the process screen that, when triggered, would blast a large volume of water up from under the screen all over the actors and set. 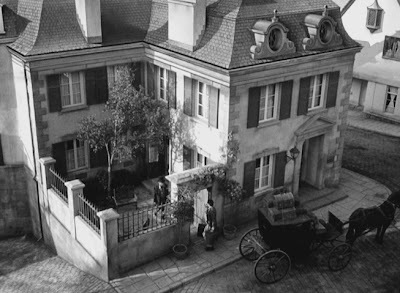 Alfred Hitchcock used a similar gag to excellent effect a few years earlier for his wonderful FOREIGN CORRESPONDENT where effects men Paul Eagler and Lee Zavitz blasted water straight through a disposable process screen at the actors. I'm pretty sure this too is a matte shot depicting the rolling hills and sheep of colonial New Zealand. 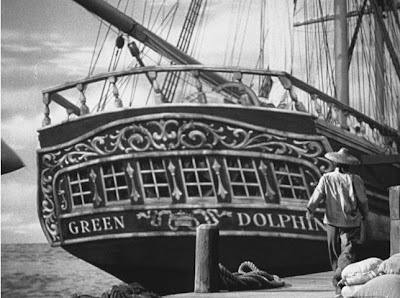 The sinking of The Green Dolphin - an elaborate Gillespie miniature effects sequence that was omitted from the final cut and sadly, only verbally referred to in the narrative, which seems such a waste of what was clearly great work. That Gothic Convent again - this time under atmospheric moonlight.